The banks are no longer sitting on the sidelines of small business lending. 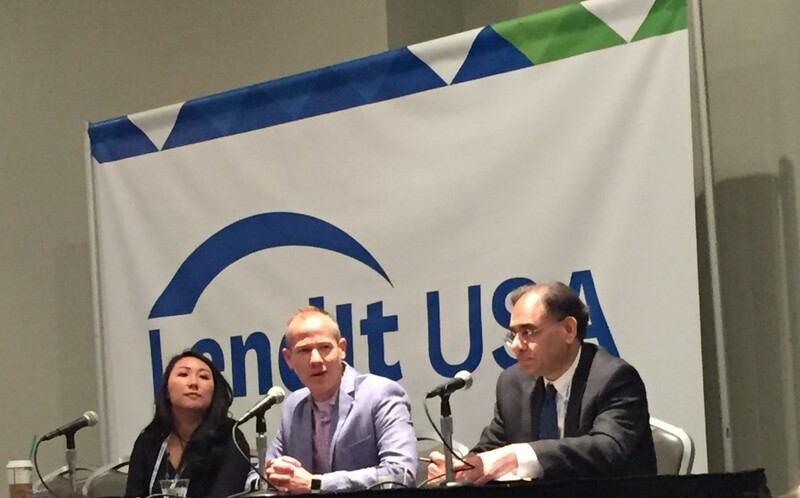 At LendIt on Monday, a panel featuring representatives from two of the biggest banks in the country, reminded young upstarts that they intended to be the primary capital sources for small businesses. Unlike JPMorgan Chase, which partnered with OnDeck, Bank of America (BoA) decided to build the technology to deliver loans easily and quickly on their own. BoA SVP Nadeem Tufail said that reputational risk had held them back from partnering with a platform back when they were considering it years ago. “We couldn’t make that leap,” he explained, citing factors like cost, which they saw as simply being too high on some platforms to feel comfortable with. But that doesn’t mean that the opportunity has passed them by. “A Bank of America customer can get funded in 48 hours,” Tufail proclaimed, while adding that a business that doesn’t bank with them can get a loan from them in about 7 days. The bank is also now doing fully automated approvals on a very small scale with a sliver of their best clientele to test the concept. Meanwhile, Julie Chen Kimmerling, Senior Manager at Chase, made it a point to say that they were also really worried about things like reputational risk but that they found OnDeck to be a perfect fit. The maturity of their management team and platform really impressed them, she said. Still, Chase governs how the loans are underwritten and keeps the customers on their balance sheet. So they haven’t exactly handed the keys over to OnDeck but obviously trust their brand to be affiliated. BoA recognized that some of their customers were telling them that they shouldn’t have to submit all these documents when the bank should already have access to their financial histories, particularly their cash flow. Tufail said that this was one of the most important factors in their underwriting. “Does the business have cash flow?” he said. “Does the business have liquidity?” The bank should already be able to evaluate these metrics. “We certainly have an advantage with transactional level data,” Chase’s Kimmerling said of banks doing loan underwriting. And Chase is no amateur in this market. Kimmerling said that her bank had provided $24 billion of credit to US small businesses last year alone, a figure prominently displayed in their last earnings report. To boot, both banks retain brick & mortar presences around the country, an advantage for small business customers, who they say are pretty likely to visit a branch. The banks it seems are coming back. Lendio CEO Brock Blake moderated the panel. Quotes and paraphrases were derived from the panel. The summary is my own analysis of it.